It can be frustrating to not be able to locate a record. As a problem-solving approach to try and locate it, pretend you found it. What would be on the record? Where would it be located? Where would it have been recorded? All of those are details that may help you actually find the record. Just because seemingly different sources agree does not mean that they have to be correct–it just means that they agree. Consider whether or not the sources are truly independent. Sometimes different “sources” have the same actual person directly or indirectly providing the information. My grandmother’s 1935 marriage record, 1994 death certificate, and 1994 obituary all provide the same place of birth for her. Grandma was essentially the informant on all three because her children provided what they were told for the death certificate and the obituary. And all three gave places different from Grandma was actually born. Just because Grandma was consistent does not necessarily mean that she was correct. This is why. Because they can lead you to someone else. A search for my great-uncle, Alvin Ufkes, located a reference to him as a pallbearer at the 1962 funeral in Quincy, Illinois, for sister of his grandmother . 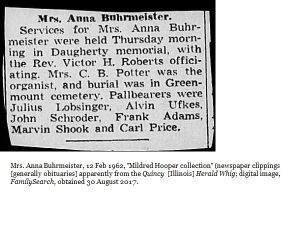 I may never have located the death notice and the obituary for Anna Buhrmeister (a few days earlier) if I had not searched for my great-uncle in the collection from which this image was taken. This stone has a date of death for the wife that differs from the date of birth listed on her guardianship in the 1850s. The stone is transcribed as written–I don’t change what something says. But the guardianship record is more contemporary to Franciska’s birth and the informant on that record is likely her mother. 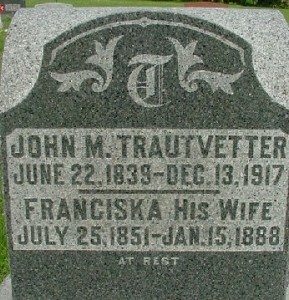 Based on estate records for husband John, this stone was erected after his death in 1917–some time after Franciska died with information provided by someone who did not have first hand knowledge. I indicate exactly what the stone says, but for I would give the most credence to the date of birth from the record that was created most closely to her actual birth. 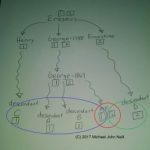 Response to our initial webinar on AncestryDNA that we are working on a new presentation for 8 September–“Working with Your DNA Matches.” This session will focus only on using your matches and working with them. Registration is limited. There are more details on our announcement page. When dating pictures, look to see if anyone in the photograph is wearing a ring on their “wedding finger.” This could be a clue as to when the photograph was taken. Unless the ring is very clear and easy to compare to the “known wedding ring,” be careful using the presence of a ring on the “right” finger as 100% proof of marriage and photograph date. Like most things, it is a clue. 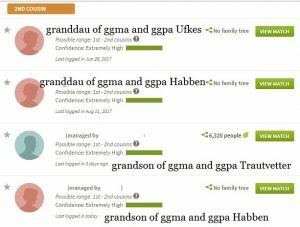 DNA tests for genealogical research have been heavily marketed. There are times when they will solve problems–or at least help to solve a problem. But DNA needs to be used in concert with other forms of documentation that researchers have been using for years. And DNA will not necessarily make your genealogical research easy. It will give you one more tool in your research toolbox. But it is not the only tool. 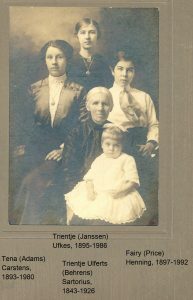 Ira Sargent is enumerated in the 1850 and 1860 US Census under the last name of his step-father, Asa Landon. Ira was born in the 1840s and his father, Clark Sargent, died around 1848. By 1850 his mother had married Asa Landon. Ira’s 1870 marriage record is probably the first document where he actually provided his name to the records clerk. Chances are someone else gave his name to the 1850 and 1860 census enumerator. Is that why you can’t find your person in any record until they get married?